The Tiffen 77mm UV Protector Wide Angle Mount Filter is a general use, clear filter that helps to absorb ultraviolet light and reduce the bluish cast of daylight. This filter is especially useful when photographing at high altitudes or around bodies of water. No additional coloration or contrast is provided, allowing you to pair this filter with others. This filter features a slimmer profile mounting ring, which is ideal for use with wide angle lenses. It does not have front filter threads for stacking filters. 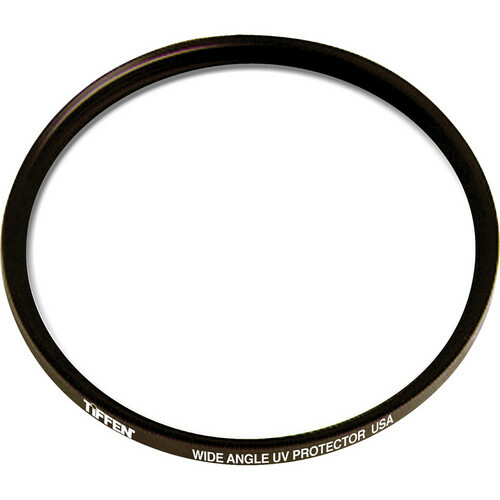 77mm UV Protector Wide Angle Mount Filter is rated 4.1 out of 5 by 16. Rated 3 out of 5 by The Caribbean Amphibian from Reduced the sharpness of my lens I have Tiffen filters on more than half my lenses and have been pleased with their performance. I bought this filter at the same time I bought my Nikkor f/2.8, 17-55mm. The lens has been touted as being very sharp. However, I was disappointed in the sharpness of the images I was capturing with my new lens. At first I thought I had a defective lens, but a little experimentation demonstrated that the filter is the problem. This may be a great filter, but not when coupled with this lens. Rated 5 out of 5 by MSquared from Saved my $1k lens! I am happily replacing this filter after it cracked in half but completely saved my lens from a nasty drop to the ground. I could not happier that I had this attached! Also, FWIW my lens cap still fits with this - Canon EF 24-105mm lens. Rated 2 out of 5 by Anonymous from Can't attach a nikon lenscap! I boght this for use on a Nikon 12-24mm DX lens, and it works well and so far doesn't seem to cause any vignetting. Alas, because of it's wide angle design, there is no place for the lens cap to clamp on to. I haven't owned it long enough to compare the quality, but the fact that I can't use a lens cap with this is definitely problematic. Not recommended at least for Nikon lenses unless you don't ever use lens caps. Rated 4 out of 5 by hale from lens protection Provides protection for your expensive glass. Personally I have transitioned to using polarizers on all lenses for landscape work, and only use this when I am shooting sports or indoors as an extra layer of protection for my expensive lenses. Rated 1 out of 5 by Ars Photo from sharpness lost I'm using a 17-55 f 2.8 and a 10-22 Canon lens and when this filter was installed in boht lenses I noticed in my photos an evident loss in image quality, maybe a little loss but noticeable. Rated 4 out of 5 by Anonymous from Perfect for protecting my new lens! Product fit my lens perfectly and will protect the $ lens from damage. Rated 4 out of 5 by Schroederphoto from Ditch your lens cap I didn't get to use this filter because it is so slim the lens cap can't clip to it. Some people don't want to use a lens cap when they put on a UV filter, so if you are that person, don't sweat it. If you like to have a lens cap, just know it may not fit. I exchanged it for a standard Tiffen UV filter and I expect the same high quality with the replacement as I do with all Tiffen products. Rated 5 out of 5 by rfsphoto from Ultimate Protection I bought it along with my Nikon 10-24mm lens. So it will stay on it as long as I have it. Being an ultrawide lens, you need the slim filter to go with it. This one does the job! i need to buy a 77mm uv filter for a Tokina 11-16mm pro dx-II lens can I use a regular 77mm uv filter or do I need to buy the wide angle thin one for the wide angle lens. I know there a big difference in the prices. which one do I need to buy? The filter and lens are 100% compatible and the filter can be used with a lens cap and lens hood.